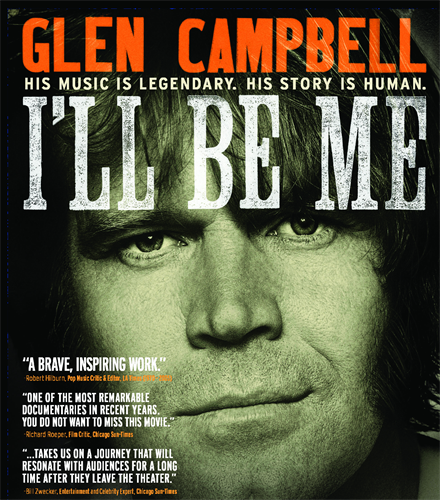 SeniorCare Inc. presents Glen Campbell: I’ll Be Me, on Tuesday, April 3, 2018 at 5:00 p.m. at The Cabot Cinema, 286 Cabot Street in Beverly, MA. The film will be followed by a discussion and cocktail hour in the Streetside Bar. This presentation is sponsored by The Residence at Riverbend with additional support from Tufts Health Plan Foundation. Glen Campbell: I’ll Be Me tells the story of music legend Glen Campbell, his life, his music and the extraordinary 151-city "Goodbye Tour" de force that's made him a hero. This powerful portrait opens the world of the singular talent who created hits like Rhinestone Cowboy, Wichita Lineman and Gentle on My Mind. Winner of the Grammy for Lifetime Achievement and member of the Country Music Hall of Fame, Glen was the first country music star to cross over to the pop charts, opening a new realm of opportunity for generations of country musicians. There is no charge to attend this presentation. However, advance reservations are requested, and donations to support SeniorCare’s programs will be accepted. To reserve a ticket or for more information, contact SeniorCare’s Communications Officer Tracy Arabian at 978-281-1750 or tracy.arabian@seniorcareinc.org. For more information on SeniorCare’s programs, visit www.seniorcareinc.org or like us on Facebook.